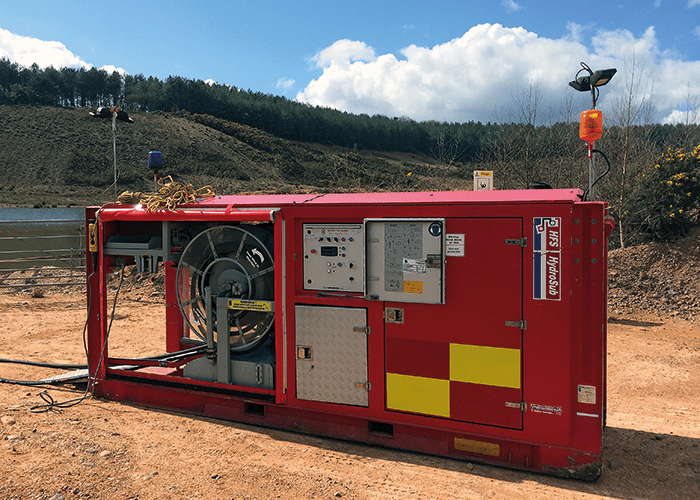 The following article provides the reader with a description of the UK Fire & Rescue Service National Resilience High Volume Pump (HVP) capability and its component parts. The original New Dimension Programme was designed to strengthen the UK’s ability to handle emergencies and crises, and was a Government response to the devastating terrorist attacks of 11 September 2001. New Dimension capabilities were introduced in 2003 with the aim of providing the specialist capability and structure that enabled the delivery of a co-ordinated response to a range of serious, significant or catastrophic incidents that have national impact. New Dimension asset ownership has now been transferred from central Government to those Fire & Rescue Services which host them. These assets are also supported by a maintenance and logistical structure. Command & Control/ Enhanced Logistics Support (ELS). HVPs in England are supported by a team of three seconded F&RS Officers as part of the National Resilience Assurance Team. Across England and Wales HVPs are hosted by 40 Fire & Rescue services (F&RS) and there are 51 HVP sets in total. These HVPs are available to support incidents within their own local F&RS area but are also declared available to assist with national or major incidents. Since their first large scale deployment to the Buncefield Fire Depot fire in 2005, HVPs have been utilised at a national level in 2007, 2009 and each year from 2012 to 2015. These deployments have included wide area flooding, coastal tidal surges and wildfire incidents. It is notable that during February 2014, the entire HVP national capability was deployed operationally due to impacts associated with the flooding events across the south of England. 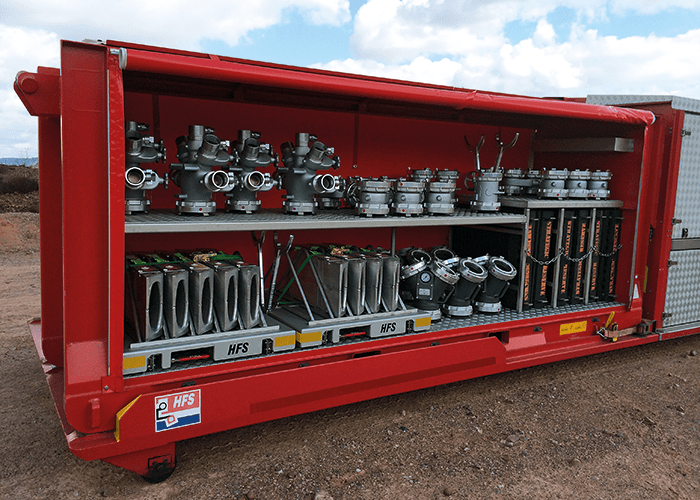 Each HVP set comprises two modules which are carried on a prime mover vehicle. Each module is carried on a demountable sled and can be further split down into individual ‘boxes’. The HVP pump module consists of the hydrosub submersible pump module and a hose box containing 1 kilometre of 150mm delivery hose in 50 metre lengths. The pump module carries the motor unit and submersible pump itself. Each submersible pump can be deployed to a distance of 60 metres via a hydraulic power hose system. The submersible pump is deployed and recovered by means of an onboard winch. HVP operators are also provided with appropriate clothing and equipment to allow them to enter the water to assist with positioning and retrieval of the submersible pump. The second HVP module consists of two individual hose boxes each of which contains one kilometre of 150mm delivery hose in 50 metre lengths. Therefore each HVP set can deploy up to three kilometres of hose along with each submersible pump. In addition each module carries a range of ancillary equipment that support different configuration options for the hose, and allow for connection to a pressure fed supply and for the submersible pump to be inserted as a booster pump in a water relay system. Ramping sets are also carried on each module and can be laid where hose lines cross roads and can maintain access during deployments and operations. To further enhance the flexibility and effectiveness of the HVP capability, eleven ancillary modules and a ramping support module are strategically located across England and Wales. These modules offer an enhanced range of supporting ancillary equipment and ramp sets and can be requested to assist with complex or protracted deployments. The operation of the submersible pump is controlled by the Master Display Module (MDM) and control panel on the hydrosub pump module. A separate pendant control operates the winch and hydraulic power hose reels during pump deployment and recovery. The delivery hose is laid from the rear of a hose box when mounted on a prime mover and travelling at low speed. The recovery of deployed delivery hose is controlled via a Hose Recovery Unit (HRU) mounted on each module and managed by two HVP operators working in the hose box to correctly stow the recovered hose. The HRU is hydraulically operated and can be utilised on either side of the module allowing hose to be recovered to either left or right of the prime mover. The HVP pumps in use in the F&RS in England and Wales are the HFS 150 model manufactured by Hytrans in the Netherlands. Each pump is fitted with a ‘hi flow’ impeller which replaced the standard impeller fitted to each HVP submersible pump. The maximum effective pumping capacity of the HVP is 7000 litres per minute although this is dependent on a range of factors. A performance calculator is available for those in charge of HVP operations to determine the number of pumps required, distances and achievable pumping capacity. The operator can insert a range of variables into the calculator – these include pump lift, height gain or loss to discharge point, single or twin hose lines and desired pressure.